One of the wonderful things about pursuing a Ph.D. in the American Civilization program at UD is that, in addition to spending several years cultivating a research specialty and scholarly expertise in an historical subject of choice, one also has the opportunity to spend time developing specialized professional skills attractive to potential employers. My years in the AmCiv program have given me the time and flexibility I have needed to gain valuable real-world experience in the fields of special collections librarianship and archival work, in the context of my broader scholarly interest in book history and material texts. 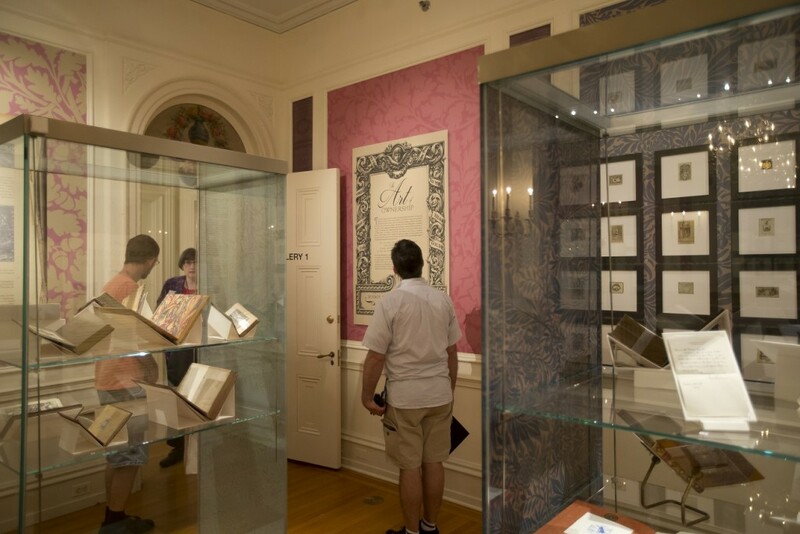 The best example of this is my work on a new exhibit now on display at the Rosenbach Museum & Library in Philadelphia, titled The Art of Ownership: Bookplates and Book Collectors from 1480 to the Present. The experience of curating this exhibit has proven to be one of the most unique and valuable aspects of my graduate education at the University of Delaware. I’m very grateful that the History Department and History of American Civilization program allowed the flexibility to pursue this and other job skills-oriented opportunities while matriculated in the Ph.D. program. 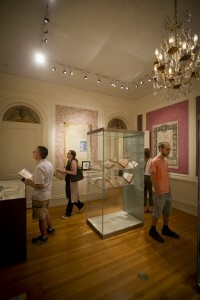 My work at the Rosenbach Museum & Library, which is affiliated with the Rare Book Department of the Free Library of Philadelphia, began when I was a master’s student in the Winterthur Program in American Material Culture here at the University of Delaware. 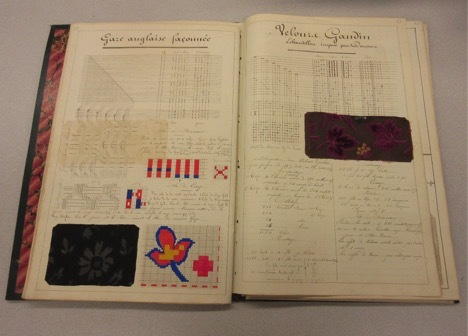 Shortly after arriving at Winterthur, I realized that I wanted to pursue a career working in special collections libraries and archives, so I decided to seek an internship in this area. 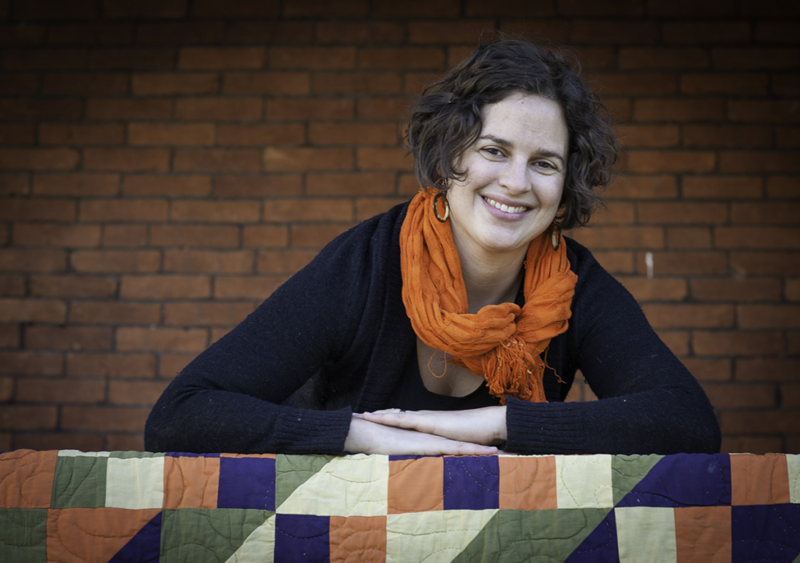 I reached out to Judy Guston, a Winterthur Program alum and the Rosenbach’s Curator and Director of Collections, about working with her and her staff. The Rosenbach appealed to me as an internship site because it is both an historic house museum and a special collections library, which seemed to combine different aspects of my experience at Winterthur. 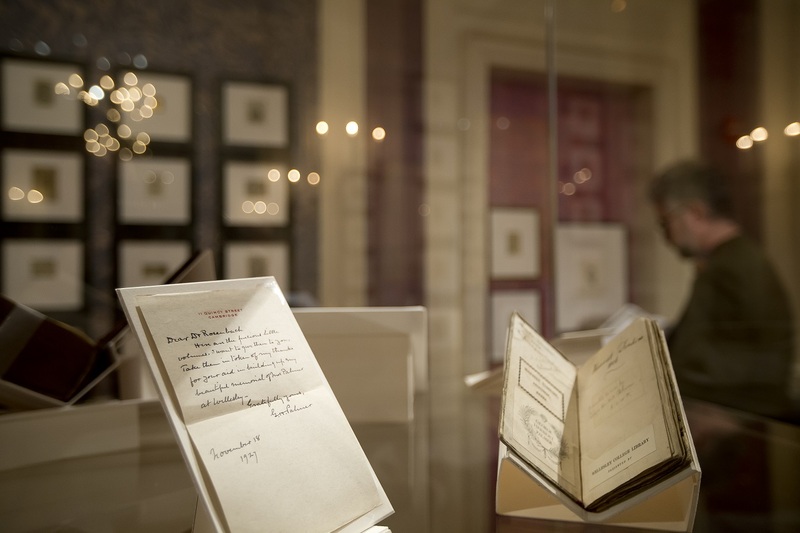 During a semester-long internship at the Rosenbach, I undertook research to identify Rosenbach-owned items to feature as part of an exhibition on the ex libris art form. I was very pleased when, upon completion of my internship, Judy invited me to see the project through to completion, which meant finalizing the exhibition checklist, researching and writing object labels and wall didactics, and generating ideas for the show’s aesthetic design and layout. I spent the summer between my first and second years in the AmCiv Ph.D. program completing much of that research, hours which count toward my museum studies certificate. 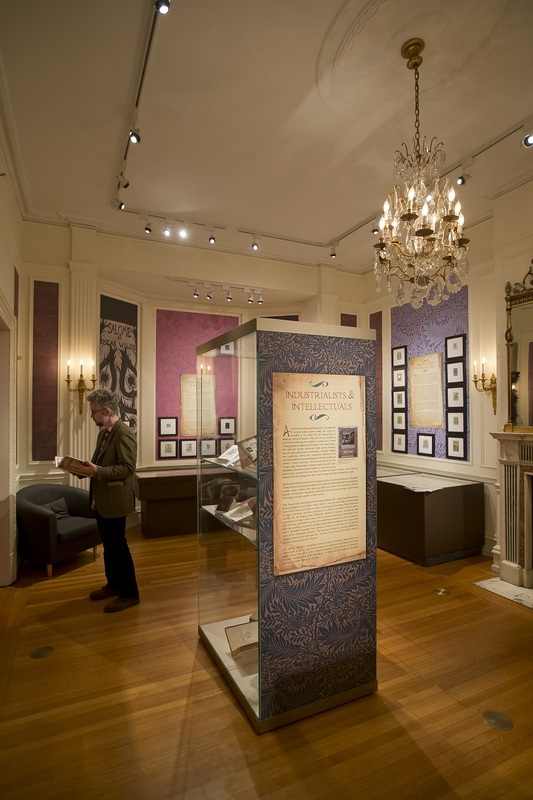 Now that the show is on display, I will gain further experience collaborating with Rosenbach tour guides and giving public presentations to promote the exhibit. Having had this kind of professional experience will doubtless prove helpful as I enter the ultra-competitive library, museum, and humanities Ph.D. job market. I am exceedingly grateful to all at the Rosenbach for welcoming me into their vibrant professional community over the course of my work on this project. Derick Dreher, Judy Guston, Elizabeth Fuller, Kathy Haas, Patrick Rodgers, Jobi Zink, Kelsey Scouten Bates, and the rest of the staff have been gracious and supportive mentors. I also recognize that I could only pursue this in-depth project at the Rosenbach with the support of my academic department. The History Department recognizes the good that can come from public humanities work, for both students and the broader community. Doctoral work within the context of the AmCiv Ph.D. program affords students the opportunity to grow as both accomplished academic scholars and marketable public humanities employees—an important combination in today’s professional environment. About the Author: Alexander Ames is a student in the History of American Civilization Ph.D. program at the University of Delaware and a member of the Grolier Club in New York City. He plans to write a dissertation about Pennsylvania German calligraphy and manuscript illumination practices between 1750 and 1850. He tweets @Alex_L_Ames. Want to know what happened when our intrepid program director, Katherine C. Grier, tried a vintage electronic pet brush on her cat? (Don’t worry, no pets were harmed in this experiment!) To learn about the V.I.P. 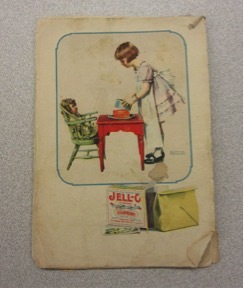 Electric Pet Brush and others examples of the material culture of pet keeping (like this postcard above), check out Prof. Grier’s new blog. 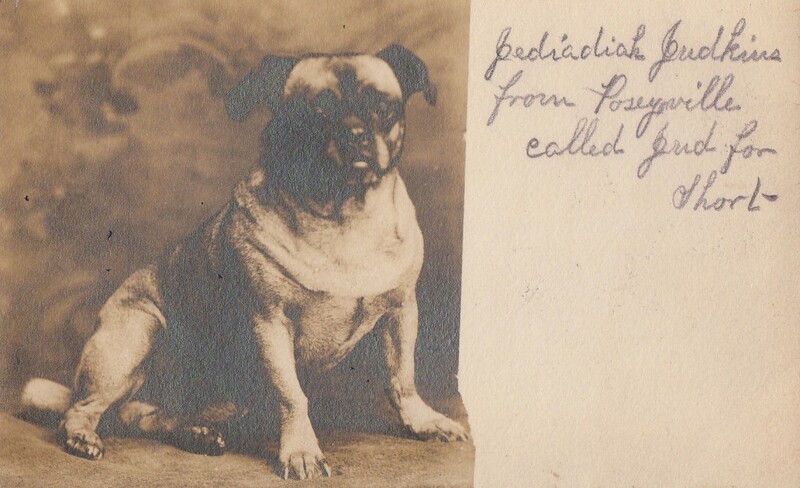 If you can’t get enough there, try her book, Pets in America: A History. “Collecting Disability History,” UK Disability History Month 2013 series, Disability and Industrial Society: A Comparative Cultural History of British Coalfields 1780-1948, November 25, 2013. “The Muhlenberg Family and the War for American Independence,” The Transatlantic World of Heinrich Melchior Mühlenberg in the Eighteenth Century, eds. A. Gregg Roeber, Thomas Müller-Bahlke,and Hermann Wellenreuther (Halle, Germany: Franckesche Stiftungen, 2013). “Palladian architecture, Germanic style: The Hiester House in Montgomery County, Pennsylvania,” The Magazine Antiques (September/October 2013): 140–147. Book review of Rebecca Cawood McIntyre, Souvenirs of the Old South: Northern Tourism and Southern Mythology, Winterthur Portfolio 47, 4 (Winter 2013: 304-306. “‘Every man turned out in the best he had’: Clothing and Buttons in the Historical and Archaeological Records of Johnson’s Island Prisoner-of-War Depot, 1862-1865,” Northeast Historical Archaeology 40 (2011, published 2013): 86-103.